Affiliate Marketing is one of the easiest ways to make money online in Nigeria and in this blog post, i will like to write about the 5 best affiliate programs in Nigeria that are still paying in 2017. Affiliate marketing is a performance based marketing in which a program or business rewards affiliates with certain amount of commission like 1%, 5%, 50% or even 100% for every sale of the company’s product or services generated or referred through the affiliate’s unique referral link or url. Even though there are many affiliate programs in Nigeria, knowing and participating in the best affiliate programs can be quite rewarding over time. 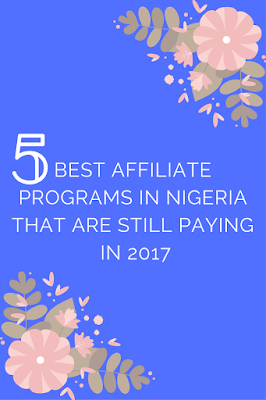 below is a list of 5 best affiliate programs in Nigeria that are still paying in 2017. Jumia is one of the largest e-commerce websites in Nigeria with millions of products on display available for sale and new products being added daily. The Jumia Affiliate marketing is free to join and earn. How does Jumia affiliate Marketing works? New affiliates fills the affiliate signup form and wait for it to be reviewed and approved. Once approved, affiliates can then go ahead to browse the available products and choose the ones they will like to promote in the various categories like fashion, computers, mobile phone, kids, parenting, books, health etc. Then Affiliates generate the tracking url to the product and start promoting. Once a sale is generated through the unique affiliate url, such affiliate will earn a commission of a certain percentage of the price of item sold. Jumia Affiliate Program is still paying in 2017. Apart from e-commerce, there are other easy ways to make money online with affiliate marketing and one of such ways is through being affiliate to website hosting companies. Web4Africa has one of the best affiliate programs in Nigeria and it’s a leading provider of web solutions (including web hosting, domain registration etc) in Africa. In the Web4Africa Affiliate Program, affiliates will earn a 10% commission on any confirmed sales generated through the affiliate’s unique referral link. Web4Africa accepts Bitcoin, Perfect Money, Skrill, Payza, and more for Domain Registration, Web Hosting, VPS Hosting, Dedicated Servers. It’s free to join the Web4Africa Affiliate program and commissions are paid after 90 days of a specific earning in order to reduce fraud or deal with refunds in the affiliate program. Web4Africa Affiliate program is still paying in 2017. 4. Wakanow Affiliate Program. This is an excellent affiliate program for the Holidays and Travel industry. And it allows affiliates to earn commissions inform of discounts on travel products like Airlines ticketing, Hotel bookings and Holiday packages. Apart from the huge commission affiliates can earn in the wakanow affiliate program, affiliates have liberty to set the prices of the different packages based on their negotiation with clients and can earn more. Coolnaira is an affiliate program for Nigerians, where affiliates can participate with a minimum of N1,000 and earn huge commissions in the long run. The Coolnaira affiliate program has 5 different packages and affiliates earn 50% commission on all direct referred sales. Because the coolnaira Affiliate program is a multi – tier affiliate program, affiliates will still earn 5% commission from sales generated from affiliates they had earlier referred to the program and this goes on upto 10 levels deep. Apart from affiliate commissions, coolnaira affiliate program also offer instant signup bonus of N1,000 and other free digital downloadable products. The Admin of the coolnaira is paul samson and he has being paying affiliates for more than 2 years now even when MMM paused their payments, Coolnaira continued to pay. Coolnaira Affiliate program is still paying in 2017.